One of Motown's finest groups, the Jackson 5, unites with funk legend Walter “Clyde” Orange as well as Bad Boy's Black Rob for a remake of the classic I Want You Back. There is also an alternate, more pop-friendly remix featuring the Jackson 5 with Black Rob and the new millennium pop phenomenon Taylor Swift. The remix featuring Walter Orange, originally the drummer from the Commodores, who was also the lead singer on the hit Brick House, has a hip hop/funk sound with strong percussion. The Taylor Swift version is more pop-oriented and features a more acoustic intro along with a much lighter beat. 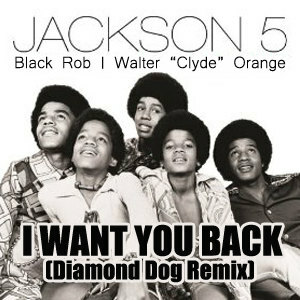 You can sample I Want You Back (featuring Walter Orange) and I Want You Back (featuring Taylor Swift) at djdiamonddog.com. You can also download the remix bundle featuring high quality versions of both remixes as well as an extended version for the DJ's. Stay tuned for more great remixes coming soon! !